The village of Malham in the Yorkshire Dales is ideal for self-catering holidays walking the moors. There is an impressive limestone rock formation nearby at Malham Cove which is a 260 ft high cliff of limestone topped with flat stones sometimes referred to as a limestone pavement and shown on the right. You may be able to spot the peregrine falcons which nest here. The whole area is dotted with limestone rock formations which add interest to walks. Gordale Scar is a gorge cut into the rock with waterfalls. 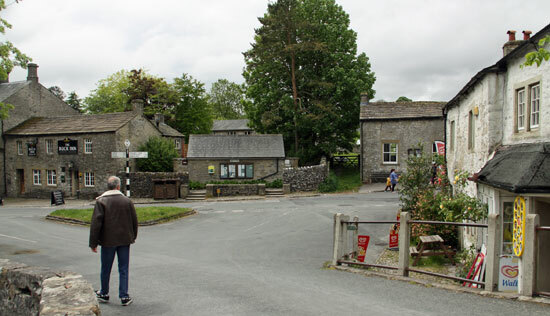 The Pennine Way long-distance walking trail cuts through the village of Malham. The village itself is pretty in a Yorkshire way, stone buildings and even a working smithy. A stream runs along the main Cove Road. There are a couple of paid for car parks and a park centre. Visitors try to avoid the parking fees and park in the section of approach road to Malham without yellow lines. There is a small amount of parking for clients at the pubs. There are various walks around Malham, also mountain bike routes and locations for climbing and caving. This area is very popular with cyclists and bikers. Cycle races and runs are often held at weekends which makes the village very busy and increases demand for parking. The countryside surrounding the village of Malham is beautiful. The scenery changes as one leaves Malham and travels past Malham Cove and northwards towards Malham Tarn and the Pennine Way. Meadows and cultivated fields give way to rough ground strewn with limestone rocks. There are plenty of examples of limestone pavement past Malham Cove, hillsides dotted with sheep and unexpectedly, a herd of Highland cattle.